So, we have looked at how to roam across the wastelands of Xeryn (devlog#2), and how vast the continent is (devlog#3). It's time to understand these lands, right? Let's step out of the game's world a bit and see how the Riven Realms - as a setting - came to be. It's spring 1990 and I'm in elementary school. My best friend brings a book to school that he reads aloud to a small group of us during our big walks at lunch break. The book has a weird old wizard on the cover conjuring smoke from a crystal ball. More interesting are the illustrations on the inside: intricate black and white drawings of strange fantasy creatures and dungeon locations. The little book is Ian Livingstone and Steve Jackson's Warlock of Firetop Mountain, translated to our native language. Most of you probably know that it's a gamebook that you do not read from start to end but in branching numbered chapters that make the story personal and add replayability. Yet they are much more than simple choose-your-own-adventure books because they include a stat and combat system you have to manage throughout the adventure - albeit a really simple one. That, our first interactive roleplaying experience, set us down on a path that culminated in what is now called the Riven Realms and is shaping up to be Vagrus the game. So, as it happens, many of you have asked us - either recently or through the years - how the Riven Realms came to be. These questions ranged from inquiring the influences on the setting to implying that it's some kind of an homage or even a ripoff of Dark Sun. Telling the story of how the setting sprung to life over 25 years ago, matured, got altered countless times, grew, and became a detailed fantasy world would probably mean telling the story of my life, which I do not intend to do here, thank god; I could, however, provide an outline for those of you interested in such accounts. So here goes. There we were, having opened a door to a new kind of storytelling and a seemingly endless well of interactive fiction. Soon, this group of kids delved deep into the Jackson-Livingstone Fighting Fantasy gamebooks. It's not to say that we were previously unexposed to fantasy, because we were (mostly in the form of B movies and animations); but the level of interactivity with these worlds was alien to us before the FF books. 1992 brought with it the first (and maybe only) Hungarian play-by-mail game, called Túlélők Földje (roughly translated into 'Land of Survivors'). I must confess that I have never played the game myself but my friends were infatuated with it for a few years so I inadvertently learned quite a lot about it. Its world was devastated by a 'great burning' and I remember that I had become really intrigued by this concept, yet I felt that their setting was too lighthearted for my tastes and was constantly trying to picture what a post-apocalyptic fantasy world would look like. So credit where credit is due: if it wasn't for this weird game, I would not have focused on Xeryn so much, probably. Around this time, we started to play our first pen and paper RPG. Hungary was some 20 years behind the Western world in many respects even after the political changes of the decade, so D&D was fairly unknown, as were boardgames and the large majority of fantasy literature. In most cases, translations did not exist for a long while or were made by amateurs. I recall experimenting with our own rule setting and playing on Titan but that soon became stale. Then came the Hungarian knock-offs of successful RPGs but they did not capture my imagination at all. Eventually, we started to play in our own campaign setting based on the fantasy world I've been busily working on. This brought with it a level of detail I previously thought unattainable and further expanded the scope of the Riven Realms. We've been practically playing ever since, changing rulesets when we felt the need (but later on sticking to iterations of D&D for the most part) and occasionally trying other pen and paper stuff as well (most notably and extensively Warhammer Fantasy Roleplay, D6 Star Wars, and Second Edition Shadowrun). These campaigns were essential in fleshing out the world, its inhabitants, and its history. Countless details (some large, some small) changed during the years to lead to the state in which the Riven Realms are now. It was eerily similar to drawing a map and filling out blank spaces as you go. Obviously, many computer games had an influence on a budding world such as the Riven Realms had been back then. So many, in fact, that it'd be impossible to list them all. It all began with pirated versions of Ultima 6 as well as Might and Magic World of Xeen, but those influences were more general on world building and less specific to Xeryn. 1998 brought with it Baldur's Gate, followed by a renaissance of computer roleplaying games. By then these products were more readily available in Hungary as well so I got my hands on them right away. I was admittedly more captivated with the games than with Forgotten Realms in Baldur's Gate and its sequel but this era opened up access to a whole new range of fictional worlds and mythologies for me to delve into nonetheless. There were a lot of games I could name that came later and had an influence on the world of the Riven Realms and the ravaged continent of Xeryn in particular. Chief among these was Elder Scrolls III: Morrowind in 2002. An alien, unique, yet familiar world was something I set as a golden standard for myself from then on. Also notably, this was the time when English started to become more and more often represented in written material and on maps. This further shifted to prominence with my studies as an English Major at university, eventually culminating in English being established as the primary language of the Riven Realms outside of pen and paper RPG sessions. With the early 2000s there came chances to obtain and read campaign settings that were previously beyond my reach. 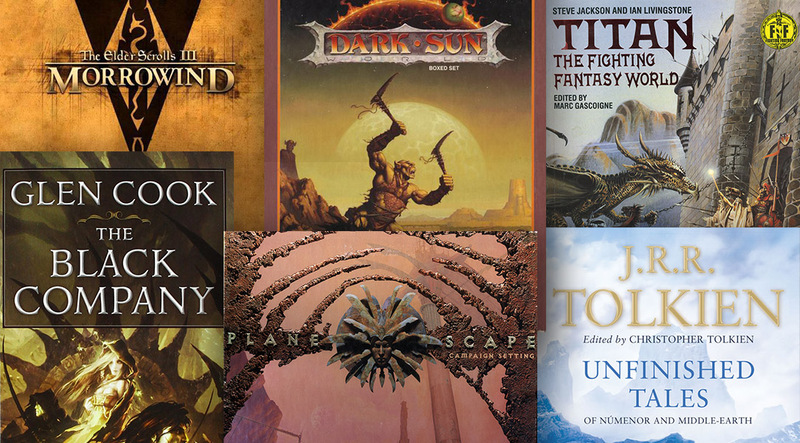 Of these, Dark Sun and Planescape were the most prominent influences on Xeryn (and are the most recognizable I think) but Dragonlance with its devastated world and cataclysm, as well as Ravenloft with its dark lands ruled by darker forces were also of utmost importance in shaping the Riven Realms. As much as I like the comparison to Dark Sun, in fact it was the last of the old TSR campaign settings I became familiar with after my friend Christian lent me the first three volumes of the Prism Pentad and I read them with reverence. The look and feel of the continent of Xeryn had already been established by that time. Of course that does not mean I haven't taken a lot of inspiration from that particular campaign setting, especially concerning the traveling companies and trading houses. I've always been a history fan, especially when it came to Ancient and Medieval times. Then my little brother became a History-Archeology Major at uni in 2005 and chose the Roman Empire and the Migration Period as his specialization. I used to listen to his long accounts of what he studied when we were back in our parents' house at weekends. We watched documentaries together on the Romans and I read some of his books and notes even. The Empire in the Riven Realms has always had a strong ancient Roman influence but these next few years laid the groundwork for a proper redesign of the Empire into the image of how it was always meant to be. This might seem a no-brainer yet I think it most certainly deserves an explanation. Because I don't just mean how Tolkien's works influenced my own writing (which they most certainly did) but also how his documented world-building had a powerful effect on my world-building. Even though I had read The Hobbit and The Lord of the Rings several times before (both in Hungarian and in English), my fairly recent re-reading of the saga and especially The Silmarillion as well as Unfinished Tales were pivotal in conscious creation of fictional myths and a genesis story. Tolkien's essays and correspondence are also great reads for anyone thinking about creating elaborate fictional worlds. There are a few honorary mentions that had a powerful effect on how the Riven Realms were formed, even though these were more literary influences than ones concerning the setting itself but sometimes it's impossible to separate the two. The Black Company by Glen Cook: I was fortunate to have come across this sequence of novels some 5 or 6 years ago. Their nonchalant, even cynical narrative and dark world of mercenaries and lowlife characters were things I immediately took to and strove to incorporate into my own style and stories. Robert E. Howard: I've been reading Conan stories since the late 90s and even though the Riven Realms is primarily dark fantasy, there are hard fantasy elements in it, and what there is had certainly been influenced by Howard's works. Also, Aquilonia has a heavy Roman/Byzantine influence, which might have had its own impression on my world-building (even though I do not specifically recall that). H.P. Lovecraft: I was obsessed with Lovecraft in my secondary school and university years, reading from him anything I could get my hands on. His influence on unfathomable, cosmic threats present in the world of the Riven Realms is undeniable, even if mostly in essence not in form. Lovecraft's works set in the Dreamlands were especially influential when it came to fleshing out the Outer Realms. It's late summer 2018 and I'm sitting at my desk, thinking about the Riven Realms, trying to give an outline of almost three decades of inspiration and creation (and fairly certainly leaving important stuff out). 28 years of imagination manifesting itself from a child's drawings to crude maps, from roleplaying backdrops to short stories - and now as the setting for a game in development. What a journey it has been! Fortunately, it's not over yet. If all goes well, this is just the beginning, and the Riven Realms might bring joy and inspiration to more than just a small group of friends. I certainly hope so. p.s. : Don't forget to follow us here on itch.io and on your favorite social media channel(s).